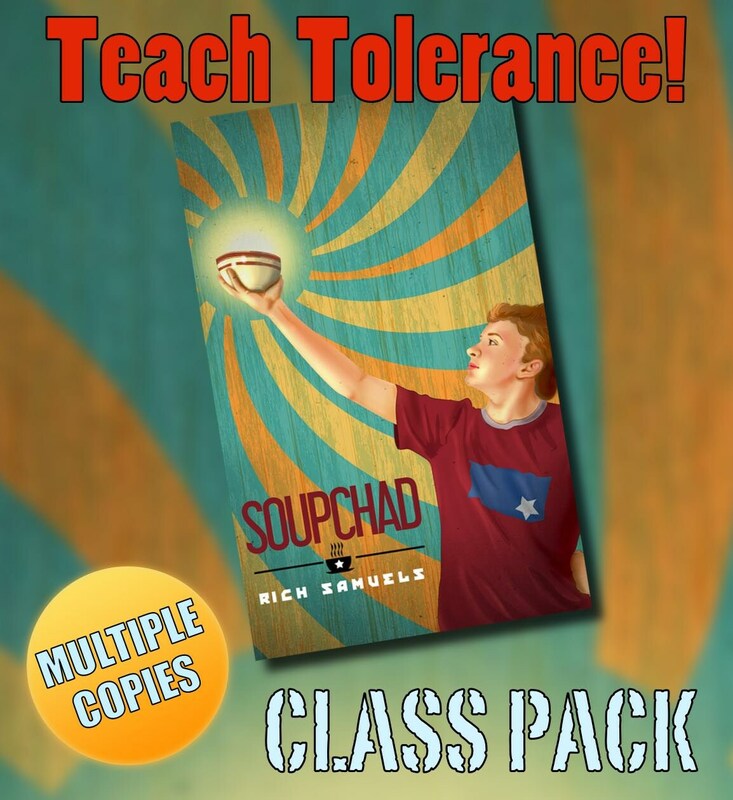 "SoupChad is the PERFECT book for all of the pre-teenagers/teenagers in your life! Rich did an outstanding job with weaving important life lessons into a book that is fun and engaging for all of its readers!" - A satisfied parent. How is it possible to teach tolerance these days without politics getting in the way? Welcome to the world of SoupChad, a boy who loves soup—and will not tolerate kids who like salad. This short novel, perfect for kids 10-13, explores issues of fairness and tolerance in a fun, non-controversial way, opening the door to worthwhile classroom discussion and real insight into the question of fairness. Letter from the author: "Why I wrote 'SoupChad'"
AVAILABLE at no extra charge: 30-minute author Skype session. 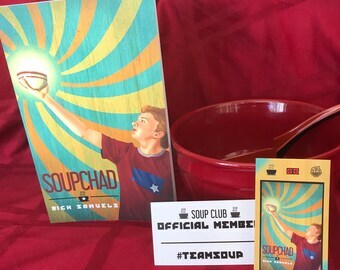 SoupChad is the tale of a middle school boy who loves soup and won't tolerate any kid who likes salad. When his family moves and he starts at a new middle school, he forms Soup Club to share his passion. Kids steer clear of him at first, until he decides to grant each one of them a new name based on their favorite soup. Spinach, Noodle and Chowder join first, followed by Matzo Ball and Potato. But power goes to SoupChad's head, and his club transforms from a gathering of soup fans to an army allied against Salad Eaters. SoupChad doesn't just hate salad, he wants to eliminate it from the school menu- and he'll do anything to make that happen. SoupChad is a story of intolerance and power. While it's a fun, absurd picture of middle school obsession, it's also an allegory that pokes fun at the tendency to see every opposing point of view as an epic battle between Good and Evil, where there is no middle ground and there are only winners and losers. SOUPCHAD: Soup, Salad...and Middle School! The Alexander Adventures Trilogy Gift Set - A Boy Faces His Fears...and Wins!